I know this really has nothing to do with gardening or sustainability or, really, anything of substance, but I feel compelled to share this engaging story with my readers. As we were driving down I-5 in a more rural area of Washington State we came up behind an 18 wheeler truck. The kind that BJ McKay and his best friend Bear would be hauling along in. But, on the back of this truck were two large white sheets of paper taped onto the doors. Now, after I recovered from my mixture of semi-amusement/disgust I asked my husband if he saw the signs as well. Since he was diligently paying attention to the road, he merely stated "isn't that one of those race car carrying trucks?" Now, I have no idea how my husband, whose only exposure to NASCAR is "Talladega Nights", would know this, but sure enough as we were passing the truck, emblazoned on the side was the big NASCAR emblem. 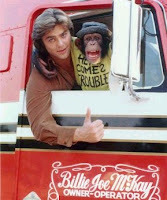 Of course, if Greg Evigan (ca. 1979) were actually driving this truck he may have gotten a little more Ta-Ta action. But the dude? The creepy 50ish dude driving this truck? Ick. And, he was spending an unsafe amount of time looking in his side mirror to see if any passing vehicles were Ta-Ta enabled. And I know this because his mirror was about the size of our car and I could readily see him checking. As we passed I merely ignored him, but if I had my faculties about me, as well as a large pad and art supplies, I would have painted him a nice watercolor of a pair of drooping 80-year-old Ta-Tas to hold up to the window for his viewing. OMG - This made me laugh out loud. I have seen similar signs and it is always some creepy dude that has them on his truck. YUCK! No, I wouldn't really "dart" him, but I would wish to. Really I would ignore him and fume quietly. Which movie was it where the woman shot the guy's gas-filled tanker truck and it blew up into a mushroom cloud - Thelma and Louise?? ?